The Lewis Walpole Library, a department of the Yale University Library since 1980, is an internationally recognized research collection in the field of British eighteenth-century studies. Its unrivaled collection of Walpoliana includes half the traceable volumes from Horace Walpole’s famous library at Strawberry Hill and many letters and other manuscripts by him. The library’s book and manuscript collections, numbering over 32,000 volumes, cover all aspects of eighteenth-century British culture. 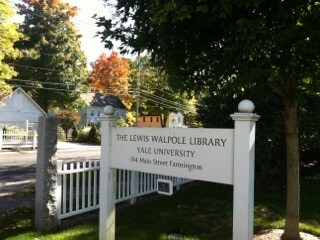 Located in Farmington, Connecticut, forty miles north of New Haven and within easy distance of Boston and New York, the Lewis Walpole Library’s collections also include drawings, paintings, and furniture, all housed on a fourteen-acre campus with four historically important structures and extensive grounds. The library runs an active fellowship program and sponsors conferences, lectures, and exhibitions in cooperation with other Yale libraries and departments.